Mexican firm Desnivel Arquitectos has completed a residence that includes a large living area with no walls, and a covered walkway that overlooks a lush garden and a swimming pool. 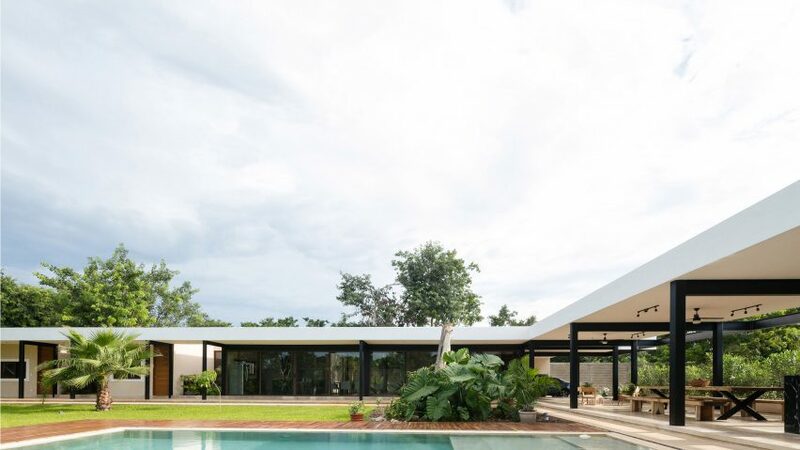 Casa Sitpach is located in the town of the same name on the Yucatan peninsula – a tropical region in Mexico that receives ample rainfall. The design of the 6,092-square-foot (566-square-metre) structure takes cues from a traditional hacienda – a large estate – with living areas situated around a courtyard and walkways open to the elements. These features allow its residence to enjoy the outdoors, rain or shine. The home's inward-looking design has a gated entry and driveway, and appears closed off and private from street view. "The entryway has stairs like typical old haciendas," said Desnivel Arquitectos. "Continuing the hacienda concept, we substituted stone columns with steel ones, making the construction more contemporary, as well as faster and cheaper." Upon entering through wooden doors is an open-plan kitchen, living, and dining room, which is situated at the junction of the L-shaped home. Along one wing is a covered outdoor hallway constructed from steel columns, which links four bedrooms – each with their own bathroom. The other wing accommodates the expansive outdoor living room, complete with a wet bar, dining table, and sitting area. A red-coloured unit at the back houses two bathrooms. Lightly coloured stone floors feature both inside and out. Exterior walls are painted white, with shades of tan on the interior. Dark wood is used on kitchen cabinetry and panelled doors, as well as decking around the pool. Desnivel Arquitectos was founded by Ariel Canto Novelo in 2012, and is based in the nearby city of Mérida. Examples of other residential projects on the Yucatan peninsula are a house designed around a large outdoor space with slatted marble by Tescala Architects and a quaint retreat on a sandy lot with palm trees by David Cervera.